Bearcat Tool™ uses a specific composition of babbitt made primarily of a special lead alloy that produces a head with a remarkably long life. 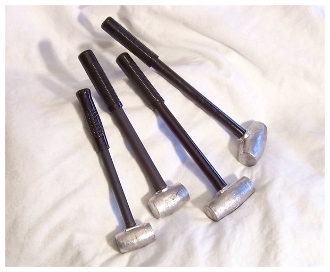 Our lead alloy hammers are some of the most versatile striking tool available, for the purpose of moving material without damaging the striking surface. From straightening drive shafts to assembling gear boxes, no man-made material can replace the dead blow characteristics of our lead hammers. This size is the most popular for knock-off auto wheels. Made in America from premium products, not a cheap import. This product contains chemicals known to the State of California to cause cancer and/or birth defects or other reproductive harm. Wash hands after handling.